Adalet markets a broad line of industrial and explosionproof enclosure products ranging from junction boxes, control stations, instrument and meter housings, increased safety terminal and control enclosures, panelboards, and motor starters to mining couplers, pilot devices, cable fittings and other hazardous and general location enclosure accessories. Cleveland, OH (January 2019) – Adalet now offers Division 1 / Zone 1 explosionproof enclosures constructed from stainless steel 316L. Designed for use in highly corrosive areas, the new cast stainless steel explosionproof enclosures provide the perfect construction material for offshore, petrochem, or volatile industrial areas where environmental conditions require additional corrosion protection. The XCESX series of cast stainless steel explosionproof enclosures provide an alternative to traditional cast aluminum explosionproof enclosures which may become compromised or could break down over time in highly corrosive areas. Rated for Class I, Division 1 / Zone 1 hazardous locations, the XCESX enclosure series carries UL, cUL, ATEX, and IECEx approvals for global applications. Eight standard sizes make up the initial offering from internal dimensions of 10”W x 14”H x 8”D up to 24”W x 36”H x 10”D. Features include a watertight gasket and stainless steel cover bolts for Type 4X / IP66 ratings, stainless steel hinge kit, mounting panel, removable lifting eye bolts, cover alignment device, cast-on mounting lugs, and internal / external ground screws. A flat plate cover allows for additional working area for viewing windows and operating devices such as pushbuttons, selector switches, and pilot lights. Adalet, a Scott Fetzer Company, is a leading manufacturer of explosionproof enclosure systems and cable accessories, enclosure thermal management products and industrial NEMA rated sheet metal enclosures and related accessories. We offer custom modification as well as standard products for more than 91 years. The company holds certification under ISO-9001 International Standards for Quality Management. Adalet markets a broad line of industrial and explosionproof enclosure systems ranging from junction boxes, control stations, instrument and meter housings, increased safety terminal enclosures, panelboards and motor starters to mining couplers, pilot devices, cable fittings and other accessories. Cleveland, OH – (January 2019– Adalet announces a new line of stainless steel circuit breaker panelboards to complement our growing line of motor control products for hazardous and industrial areas. 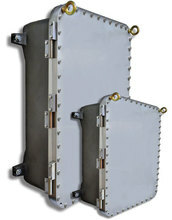 Designed for use in applications where harsh chemicals or hose down conditions exist, the Adalet N4XPB series stainless steel panelboards provide a watertight, non-corrosive solution for controlling lighting and appliance, power circuits, and power distribution in industrial applications requiring branch power distribution, over current, and short circuit protection. Utilizing electrical components from Cutler Hammer, the Adalet stainless steel panelboards are available in two versions: A dead front, swing panel version with quick access latches or a through the door operating handle version. The dead front, swing panel version isolates the wiring space, wiring gutter, and termination area which would otherwise be exposed when the door is opened. The external handle version offers the ability to operator the circuit breakers through the door with spring loaded, watertight, aluminum operating handles. All Adalet stainless steel panelboards are equipped with copper bus, isolated neutral and ground bar, and GFI or EPF breakers. Gasketed covers provide IP66 and NEMA 4 / 4X rated protection for a water tight seal, and stainless steel cover bolts, removeable piano hinge, and breather / drain are included as standard features. The panelbaords are available as 18-42 circuit, main lug or back fed main breaker (100A max). Factory sealed panelboard versions are also available designed for use In Class I, Division 2, Groups BCD and Class I, Zone 1, AExde IIB areas. For more information, contact Adalet, 4801 West 150th Street, Cleveland, Ohio, 44135, USA. Tel: 216-267-9000 Fax: 216-267-1681 Email: info@adalet.com • Website: www.adalet.com. Cleveland, OH – January 2019 – Adalet is pleased to announce the completion of a new IECEx/ATEX Flameproof Control Panel Assembly Certification. This is a flexible certification which allows Adalet to supply custom, fully populated CE-marked enclosures which are Exd Zone-certified under an EQUIPMENT Certificate. This is a turn-key solution that eliminates the requirement for customers to resubmit enclosures having only a Component Certificate for 3rd-party testing. The control panel arrives from Adalet pre-certified and bearing the CE mark, thus saving customers considerable time and money. The Adalet IECEx/ATEX Flameproof Control Panel Assembly certificate allows for control operators, motor control components, and most other CE-marked electrical components to be installed inside any of Adalet’s broad line of certified flameproof enclosures. Bolted cover designs and threaded mouth enclosures are available. Adalet installs and wires all the control components. Adalet also provides services for design review, certification compliance and required documentation. Adalet, a Scott Fetzer Company, is a leading manufacturer of explosionproof enclosure systems and cable accessories, enclosure thermal management products and industrial NEMA rated sheet metal enclosures and related accessories. Adalet has its own dedicated in-house foundry and extensive machining capabilities. They have provided custom solutions as well as standard products for 91 years. The company holds certification under ISO-9001 International Standards for Quality Management. Adalet markets a broad line of industrial and explosionproof enclosure systems ranging from junction boxes, control stations, instrument and meter housings, increased safety terminal enclosures, panelboards and motor starters to mining couplers, pilot devices, cable fittings and other accessories.